What Exactly is a CSA? What is a Nonprofit CSA? I can’t think of another vegetable that polarizes people more than beets. Folks tend to love them or hate them. I am one of those “odd birds” that fell in love with canned beets as a kid and have just grown fonder of the vegetable in its many forms throughout my life. Beets just scream healthful goodness…you can’t help but feel healthier after eating one. 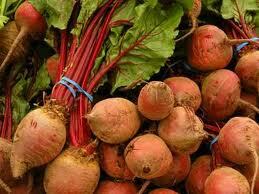 If you are one of those individuals who can’t seem to get into beets, I can only say, “keep trying”. There are so many methods to enjoy this vegetable that there is bound to be a way to your heart somehow. Beets hail from the same family as chard and spinach. They can be a few different colors, but are mostly red or golden yellow. There is even a beautiful “candystripe” variety. Beets are a nutritional powerhouse. Whatever you do, don’t toss those greens…they are the healthiest part of the plant and contain loads of vitamins, minerals, and antioxidants, making them one of the most nutritious foods available. However, the roots are far from nutritional duds themselves, offering good sources of folic acid, potassium, fiber, and natural sugars in addition to tons of vitamins, minerals, and antioxidants. Beet leaves are a tender green that cook quickly and taste a lot like chard. Young leaves are quite good raw, like in salads. However, I should mention that raw beet greens do contain a high amount of oxalic acid, which interferes with the absorption of calcium (of which the greens are high in) and in high quantities, can lead to the development of kidney stones. However, much of the oxalic acid in beet greens is neutralized by cooking. Thus, one may want to somewhat limit their use of raw greens and experiment more with cooked preparations. I like mixing beet with other greens in a general saute, or cooking the whole plant from root to leaf in one dish (see recipe below). Most folks are familiar with cooked beets, especially pickled or roasted. However, beet roots are delicious raw in salads like coleslaw. Simply julienne, shred, or thinly slice them and toss with your favorite dressing (but be careful, you’ll get a temporary stain on your cutting board and red beets will turn your whole dish pink). Beet roots are also great cooked and can be roasted, steamed, boiled, and even grilled (in a foil packet). The red beets “bleed” when raw or cooked and can stain some surfaces and temporarily discolor others, which is why you might want to consider wearing gloves and being careful when handling them. Golden beets are considered sweeter and milder in flavor than red beets, and won’t bleed or stain. They are a wonderful choice for raw preparations. For grated or julienned beets, it is especially helpful to use a food processor. Cooking beet bulbs is incredibly easy. To roast, place well washed beet bulbs in a roasting pan with a little water and cover. Roast at 400 degrees for about one hour until beets are completely tender. Once cooked their peels slip off quite easily. Another way to roast beets is to peel and cut them, possibly mix with other root vegetables, and roast in a pan with olive oil and herbs (thyme or sage work great this way). Beets can also be cooked by steaming, boiling, or grilling (cook in a foil packet for about 1 hour), These are all good cooking options for hot days when you don’t want to run the oven. 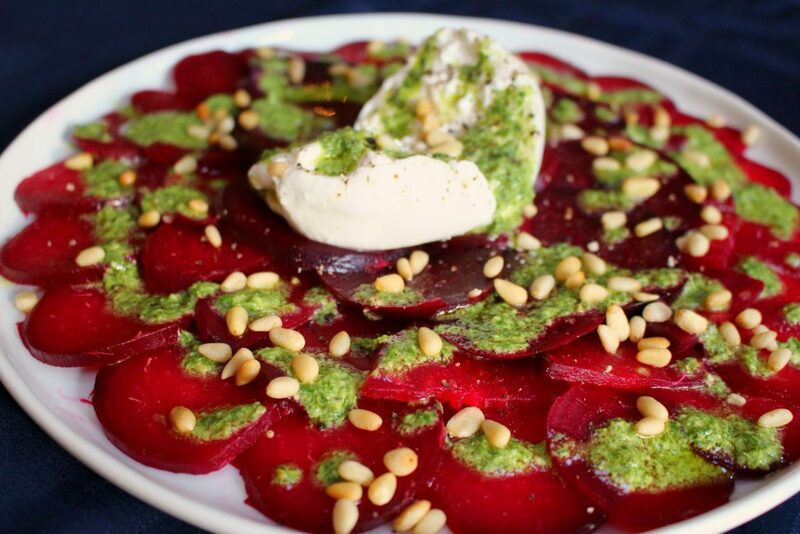 Cooked beets are wonderful tossed with butter or olive oil and herbs and eaten as a side dish. They are also terrific in vegetable or grain salads or pureed and made into soups. Some natural accompaniments for beets include most nuts, sour cream or yogurt, mustard, tangy cheeses, citrus, fresh herbs (dill, tarragon, mint, parsely, basil), ginger, horseradish, cumin, and caraway. Choose firm, unwrinkled or unblemished beet roots with crisp greens. Cut greens from roots and store each, unwashed, separately in plastic. When separated from the leaves, the roots can last a few weeks in the refrigerator. The leaves, unfortunately, get limp and lose nutrients quickly. Thus the leaves should be used within a few days. To increase the refrigerator life of the greens, try blanching them for a couple of minutes in boiling water, cooling them in an ice bath, and then draining well. Blanched greens will last an additional 3-4 days in the refrigerator. Keep in mind that beet greens tend to hold on to fine silt. It is best to wash them either in a salad spinner or large bowl at least three times to remove all the grit. The following recipe is a great way to make use of both the beets and the beautiful basil available right now at the farm. If you need a pesto recipe, this will work (click here). This dish makes a gorgeous and impressive appetizer at a dinner party, but also can add a special side dish touch to any dinner or lunch. Fresh burrata, a super creamy cross between fresh mozzarella and ricotta cheese, can be found at Whole Foods, Trader Joes, Fresh Market, and some supermarkets. Preheat oven to 400℉. Wash but don’t trim or peel beets. Place whole in a glass baking dish filled to about ¾” deep with water. Cover dish tightly with foil and place in oven. Bake for about 1 hour, or until a knife pierces easily through the largest beet. Remove from the oven and uncover dish. Allow to cool until comfortable to handle. Using a sharp knife, peel beets (skins should slip off easily). Slice beets into thin slices (about ¼” thick or thinner. I used the second smallest setting on my mandolin). Lay beet slices, slightly overlapping, in a decorative circular pattern on a 10 inch round platter (or use platter of choice). Sprinkle lightly with salt and pepper. To make dressing: Place pesto in a small bowl. Add ½ tablespoon vinegar and 1 tablespoon oil and stir well. Taste. Add more vinegar if you prefer a tarter vinaigrette or more oil if mixture is too thick or tastes a bit too tart. You can also add a bit of water to thin vinaigrette. Season to taste with salt and pepper. Cut burrata in the center from top to bottom but stop short of cutting all the way through the bottom until the burrata opens up like butterfly but stays in one whole piece. Place burrata in the center of the arranged beets. Drizzle all over with pesto vinaigrette and sprinkle with pine nuts. Serve warm or at room temperature. When serving, cut a bit of burrata and place on top of each serving of beets. The following recipe showcases how beets can be cooked from root to leaf in one dish. I chose to chiffonade the beet greens and cut the beets into matchstick shapes which allows one to easily taste both root and green in one bite. Triple wash beet greens and stems. Cut stems from greens and thinly slice. Set aside. Place beet greens on top of one another. Roll up like a cigar and thinly slice the greens (this is called a chiffonade). Roughly chop the chiffonade into smaller bite-sized pieces. Peel beet roots. Cut a slice off the bottom of each beet so they will remain sturdy on the cutting surface. Cut each beet into 1/4” round slices. Stack slices on top of one another and cut down in strips to make thin matchsticks. Set beet roots aside. Heat oil in a large non-toxic non-stick skillet over medium heat (if you prefer not to use non-stick, use more oil). Add grated ginger, garlic, and jalapeño and cook, stirring constantly, for 1 minute. Add matchstick beet roots and finely sliced beet stems. Sprinkle with 1/4 teaspoon sea salt and stir well. Cover beets and cook, stirring every couple of minutes, for about 10 minutes, or until beets are just tender. If beets start to stick to the pan, add a bit of water. Add beet greens and stir well. Cover and cook, stirring once or twice, for about 3-5 more minutes or until beet greens are wilted yet still bright green. Remove from heat. Sprinkle with 1/8 teaspoon additional sea salt, ground pepper, and rice vinegar. Stir well. Taste for seasoning and adjust as needed. Serve warm. I thought I would also offer a newly developed recipe for baby eggplants. Baby eggplants are so delicious when grilled. They get soft and creamy but have a pleasant smoky flavor. Simply toss whole baby eggplants with olive oil and sprinkle with salt and pepper and place on a grill pan on a medium heat grill, turning frequently to avoid burning. The following recipe dresses things up a bit by adding a tasty, yet healthful sauce full of inflammation fighting turmeric and creamy tahini. For sauce: Mix tahini, lemon juice, garlic, turmeric, salt, and pepper together in a small bowl. Mixture will thicken. Gradually add one tablespoon of hot water at a time, stirring well after each addition, until mixture loosens up and becomes pourable. Set aside while grilling the eggplants (sauce can be made up to 3 days ahead. Thin with hot water as needed when ready to serve). Preheat a grill (preferably charcoal) and set on medium to medium low heat. In a large bowl, toss eggplants, stem and all, with oil and season well with salt and pepper. Place the eggplant on a grill pan or directly on grill grate (if eggplants are large enough to not fall through grate). Cover the grill and cook for 2-3 minutes. Turn eggplant and cook another 2-3 minutes. Continue cooking and turning until eggplant is very tender, about 10-15 minutes. Remove from heat. Add additional salt and pepper if desired to taste. Place hot eggplants on a serving platter. 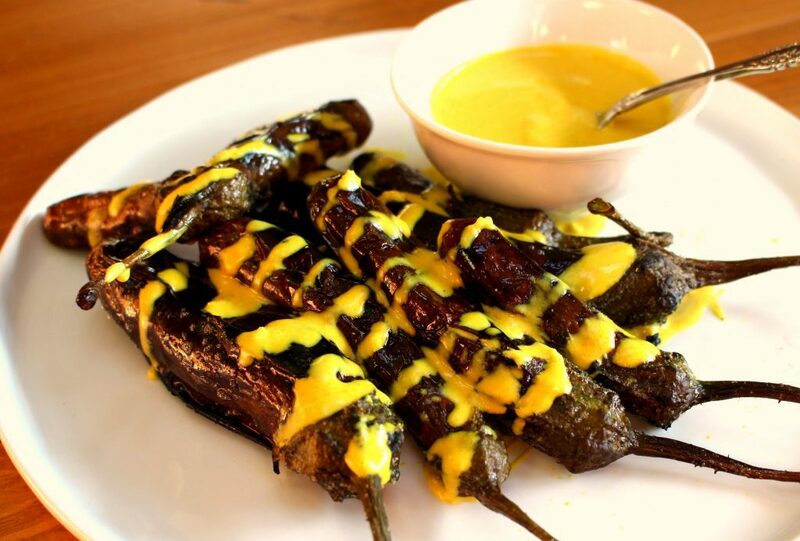 Drizzle with turmeric tahini sauce. Place remaining sauce in a bowl for dipping or spooning on eggplant while it is being served. Serve immediately. Great recipes! I’m a huge fan of the fairytale eggplant. They are tasty roasted if not using the grilled. Toss into a salad or slaw. Yummy. Thanks Julie.